The coat of arms of the Nation of Hawai‘i was drawn up during the time of Kamehameha III; a May 31, 1845 story in the Polynesian newspaper reported that the National Coat of Arms was adopted by the Legislative Assembly. In 1842, Timothy Ha‘alilio, Private Secretary to the King, and Royal Advisor the Rev. William Richards commissioned the College of Arms in London to prepare a design. The quartered shield has in its 1st and 4th quarters the red, white and blue stripes representing the eight inhabited Hawaiian Islands. The twins were Chiefs from the Kohala and North Kona districts and were uncles of Kamehameha the Great and his counselors in the wars to unite the islands. The drawings for all these emblems and ornaments were taken from the original articles presented to Captain Cook by Kalaniʻōpuʻu in 1778. The motto reads: "Ua mau ke ea o ka ʻāina i ka pono" - "The life of the land is perpetuated in righteousness". 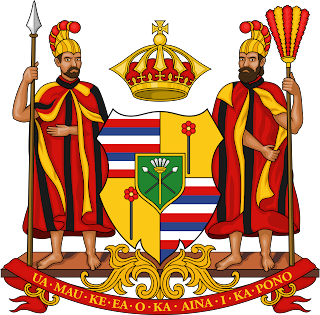 The design was modified slightly during the reign of King Kalākaua. Later, modifications to Coat of Arms were made to make the official Seal of the Republic and Territory of Hawai‘i. It was later altered in 1959 to represent the change in status from Territory to the State of Hawai‘i. The rising sun replaced the royal crown and Maltese cross of the original coat of arms. King Kamehameha the Great and Goddess of Liberty, holding the Hawaiian flag, replaced the two warriors on the Royal Coat of Arms. The quartered design of the heraldic shield was retained from the coat of arms. The four stripes of the Hawaiian flag in each of the first and fourth quarters continue to represent the eight islands. Pulo‘ulo‘u, or tabu ball and stick, in the second and third quarters were retained. The star represents the fiftieth star added to the national flag when Hawai‘i became a state. The phoenix, symbol of death and resurrection, symbolizes the change from the monarchy to a democratic form of government. The eight taro leaves, flanked by banana foliage and maidenhair fern are typical Hawaiian flora. 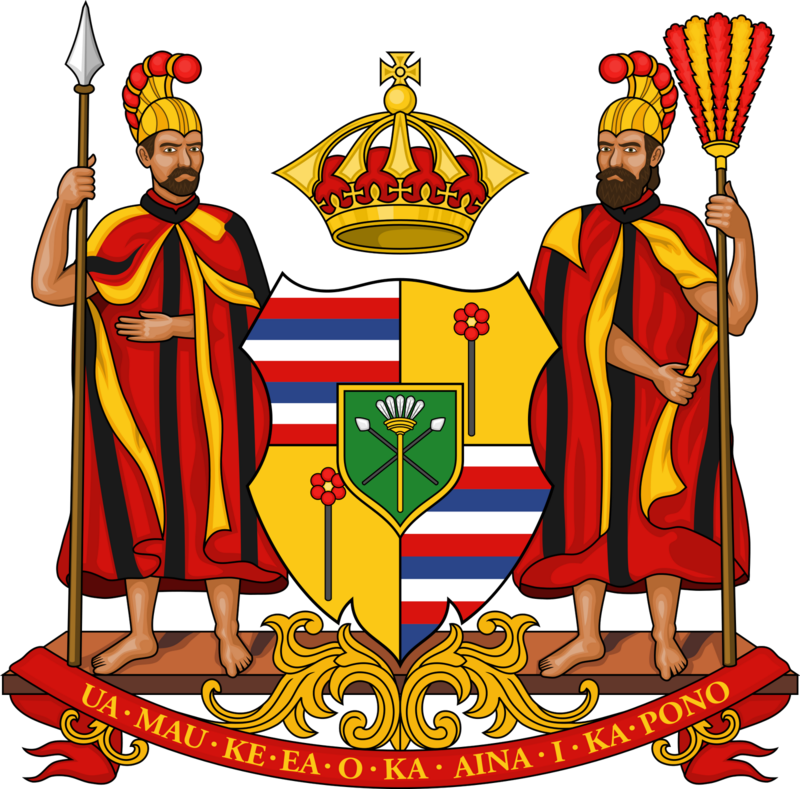 The state motto "Ua mau ke ea o ka aina i ka pono", "The life of the land is perpetuated in righteousness" was retained from the Royal Coat of Arms. The image is a representation of the Coat of Arms in 1845. In addition, I have included other images of the Coat of Arms and the Seal of the Islands in a folder of like name in the Photos section on my Facebook page.